I have toyed with the idea of running this race for the past few weeks, but I couldn't decide until literally the last hour. Finally, about 7 p.m. 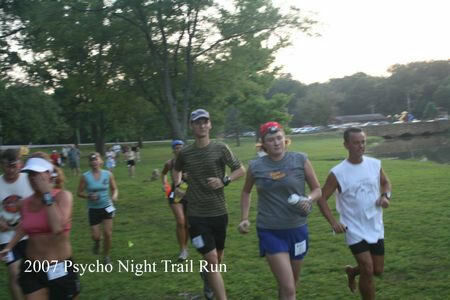 I told Rebecca that I was going over to Wyandotte County Lake to run a 10K with a bunch of guys and gals in the dark! She is an amazingly gracious woman that just says as I'm walking out the door, "Be careful and don't get hurt." Hmmm ... running barefoot, through thick forest on rocky, root-laden bridal paths with a headlamp or a flashlight and she tells me not to get hurt? Good advice, I thought as I continued to my truck with further rumination the 45 minute drive to the lake. Another consideration was that it was still 90 degrees with about 70 percent humidity! Oy Vay! 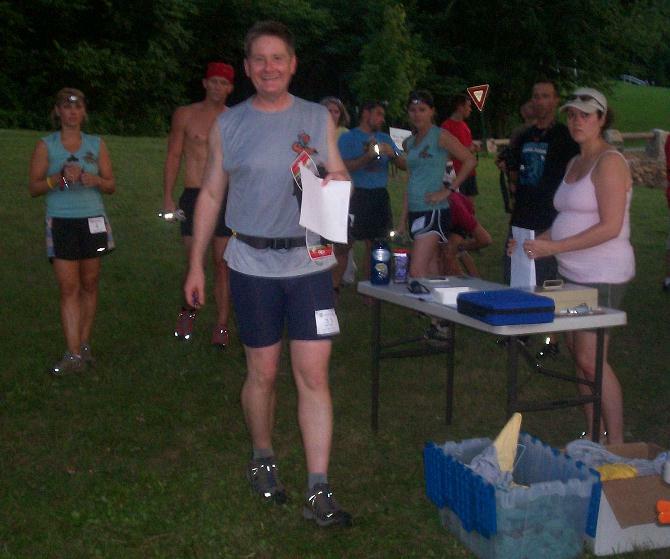 (Right) A fellow runner request a sole inspection. (Left and below) The race begins! I showed up with 15 minutes to spare. 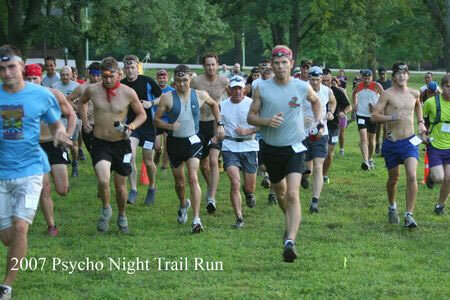 (This would be my third Kansas City Trail Nerds event.) I found the registration table with Ben Holmes and crew. I hurriedly filled out a registration form and then milled about talking to a few folks. Ben gave us some last minute instructions and we were off around 8:10 p.m. By then the sun had set behind the western woods surrounding the lake and we were quickly in less than dusk circumstances as we started making our way up the first ascent of rocky bridle path. The trail was still clear to our sight so no one was using their lights the first couple of miles. After a few ascents and descents over rocky terrain, the course leveled out for a while with some mucky conditions in places from the rain of two nights hence. Runners ahead of me were avoiding the boggy conditions, but I was relishing the cool mud as I sank over ankle deep in the goo! Ahhhh! Moments of mud of therapy were soon over, however, as we continued on. The path grew less distinct and I was having trouble with my hand held flashlight. Should have checked the batteries before I left. No matter. I was still able to see pretty well. The course did a loop at the 2.8 mile mark where we entered the 0.4 mile Wyandotte Triangle which is hairpin switch backs with several ascents and descents. Somewhere around mile three I banged my left foot pretty good. It was good enough for an out loud exclamation, but after a quick examination I noticed there was no contusion nor did it feel broke - just a good bruise. I continued through the Triangle and headed back over the first 2.8 with my weak light leading the way. For the most part, it wasn't helping me see that much as I was running by sensation and the feel of my foot placement. It was an interesting and fun way to run. You know you're having a good time when you literally laugh out loud on occasion as you sink or slide in mud or come crashing across a stream of water a bit fast and almost take a spill! It was a blast! The last quarter of mile is a descent over rocky trail (where we first ascended). I took this section a bit gingerly and then hit the clearing where I could see the finish with the cones set up. 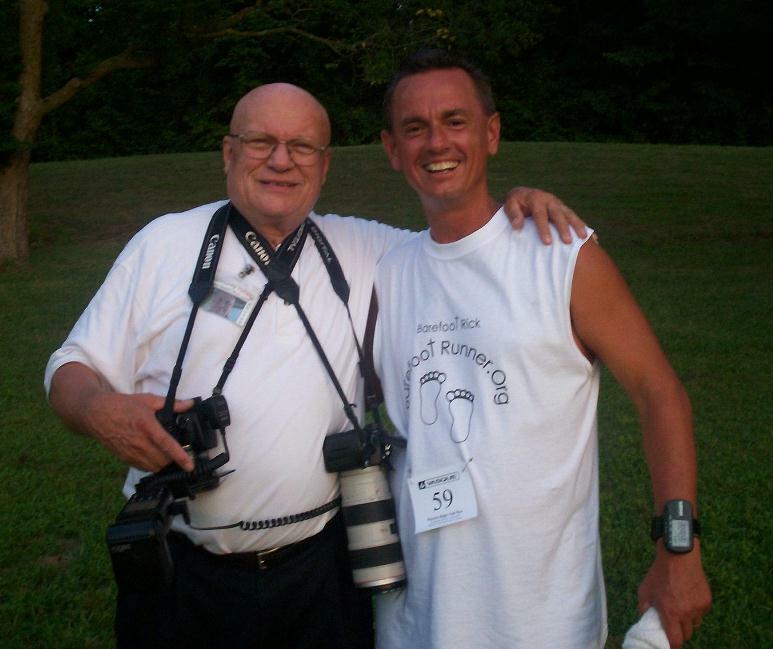 I crossed the finish line at 1:07:23 which equates to a 10:52 pace. I have found that trail running speed and pace are no where comparable to my times running on streets, but from what I understand, a 10:52 pace ain't too shabby on this course at all! Coming out of the woods drenched in sweat with the finish in sight! Bottom line about this event: It was fun! 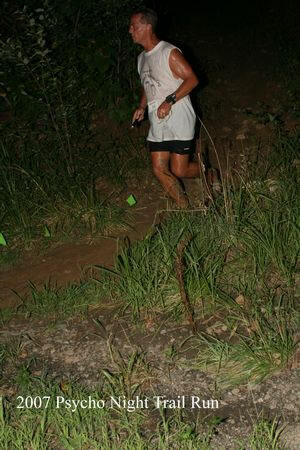 It was great to experience the trails at night and let my senses work overtime regarding proper foot placement with the ability and grace not to get injured. There is a fine line between knowing how fast one can run barefoot in dark or light conditions and also having the wisdom to slow to a secure enough pace to come out unscathed. I was grateful that I could return home to Rebecca and WALK IN under my own power, letting her know that I heeded her loving, cautious warning and had succeeded in three regards -- I had fun, I ran strong, and I wasn't injured!